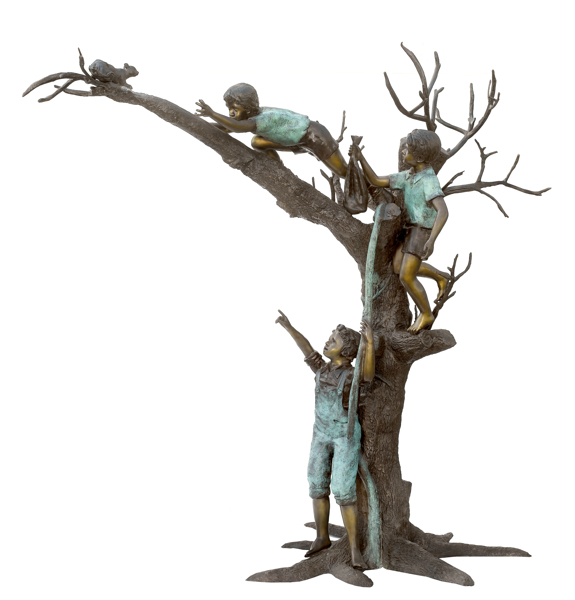 Bronze boys chasing a squirrel up a tree statue. Rather have it as a fountain? We can do that. Fabricated in the lost wax method and a true work of art. Perfect for your back yard, school, home, office building, lodge, park, resort, convention center, restaurant, shopping center, hotel or any facility seeking a great conversation piece. Makes for a great photo-op. We can modify the statue by changing the standing boy for a girl, add another standing boy or girl, add a dog, replace the squirrel for a cat or whatever. In most cases, the price will not change. Call us for more options 321 804 4642.